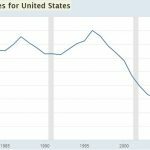 Let’s review the basics of the employment report and then look at the labor market from a few interesting perspectives not usually unearthed. The headline job growth in May was 223,000 which was so strong it beat the highest estimate which was 220,000. This caused the unemployment rate to fall from 3.9% to 3.8%. This drove headlines about how this is the lowest unemployment rate in 18 years. If it falls to 3.7%, it will be the lowest rate since December 1969. Unfortunately, the important metrics which determine the quality of the report go unnoticed. We’ll review them in the next section. Manufacturing added 18,000 jobs which met estimates. The labor participation rate fell from 62.8% to 62.7% as the number of people actively looking for work fell by 281,000. The main reason why the labor force participation rate has fallen this cycle is demographics. The median age of the country is increasing. Month over month hourly earnings were up 0.3% which beat estimates by one tenth; year over year hourly earnings growth met estimates at 2.7%. The work week length was stagnant at 34.5 hours. The underemployment rate, which adds the marginally attached workers and the workers who are employed part time for economic reasons to the headline unemployment rate, fell from 7.8% to 7.6%. That’s the lowest rate since May 2001 which was after a recession had been ongoing for 2 months. The peak of this cycle was 17.1% which shows how far the economy has come. The enormous slack in the labor market started this expansion which explains why this has been such a long one. The average weekly earnings growth is similar to the hourly earnings growth except it’s a more accurate depiction of take home pay because it controls for the length of the work week. Average weekly earnings were up 3% which is one of the strongest readings of this cycle. The strongest was 3.4% in October 2010, but that report had an easy comparison, so this one was arguably better. 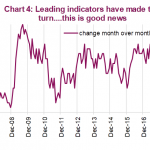 This report reflects the tightening labor market. We’re in a great period for workers since inflation is modest and wage growth is accelerating according to some metrics. Finally, the chart below shows the prime age labor force participation rate fell from 82% to 81.8% showing that many of the people leaving the labor force were of prime age; it wasn’t just baby boomers retiring. If the prime age workforce gets near the peaks seen in the most recent expansions, this cycle will last at least a couple more years. The concept of being a contrarian investor is to hold beliefs so outside the mainstream that you even question them. Avoid cynicism when being a contrarian because it gives you a temporary rush of dopamine because you feel superior, yet you end up acting irrationally. It’s very difficult to act independently of the crowd rather than disagreeing with the majority just to call yourself a contrarian. 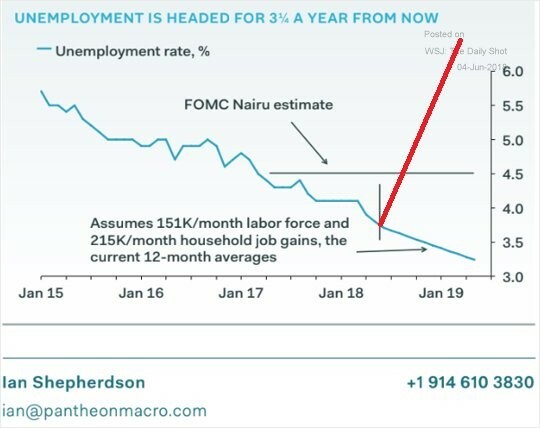 One unorthodox possibility for the labor market is seen below from Pantheon Macro. If the labor force and job growth continue on their 12 month average pace, the unemployment rate will get to 3.2% in Q2 2019. It’s important to stock market investors for the rate to keep falling because the worst case scenario for returns is when the unemployment rate is low and rising. After the unemployment rate bottomed in the past 10 cycles, on average, a recession started 8.7 months later. 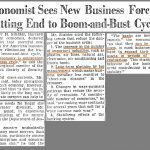 Bullish investors need the headline number of jobs created to grow quicker than the labor force. The jobless claims are at a record low when adjusted for the labor force size, so a falling unemployment rate isn’t impossible. With online stores taking share from brick and mortar stores along with the laundry list of retailers filing for bankruptcy or at risk of bankruptcy, you would expect the retail industry to be hemorrhaging jobs. 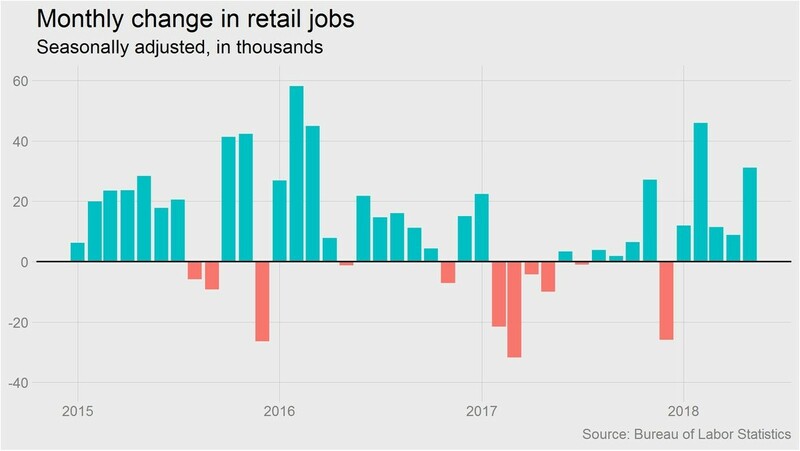 However, the NY Times chart below shows the retail trade industry has added jobs for 5 straight months as there were 31,000 jobs added in May. The headlines of firms who have lost to online competition make it seem like every brick and mortar store isn’t doing well. The stories on how well retailers such as Best Buy and Costco are doing don’t generate as much attention. To be clear, without online competition, job growth would be more robust. Online retailers actually saw a 1,000 job decline in May. The obvious ways to tell if the labor market is full is to look at wage growth, job growth, and the unemployment rate. The Haver Analytics chart below shows another great way to measure the slack in the labor market. 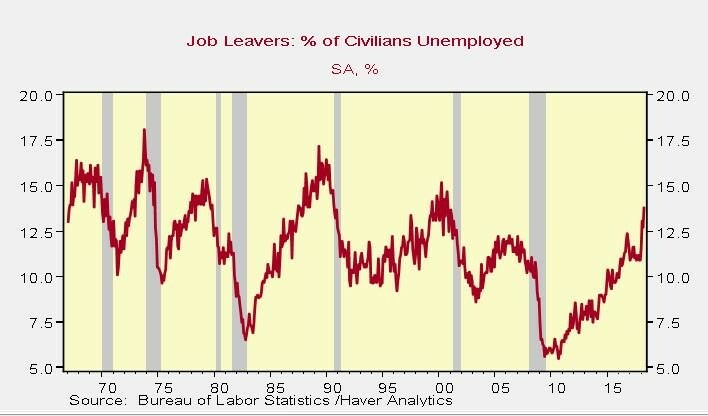 It shows the job leavers as a percentage of the civilians unemployed. If workers have the confidence to leave their jobs, then the labor market must be very strong. If only leavers were unemployed then that would cause a severe uptick in the compensation rate because these potential workers are trying to get better pay or working conditions than their previous job. The current leave rate is 13.8% which is the highest since November 2000. The rate peaked at 15.2% in that expansion. The average peak in the past 7 expansions is 15.3% which implies the labor market is closing in on full employment. If the recent spike continues, it will get there soon. 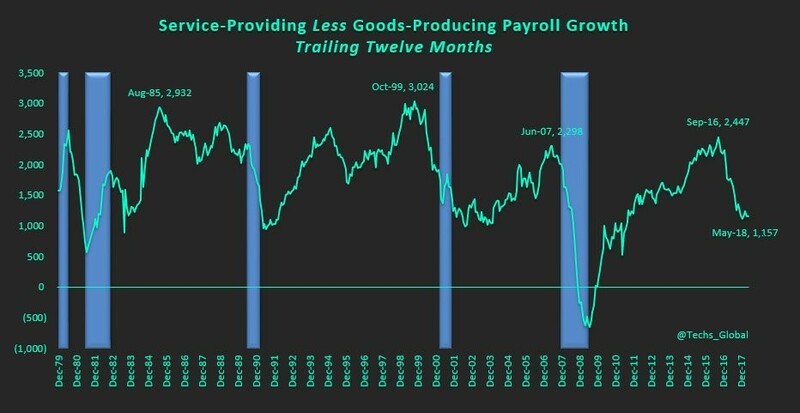 The labor market is in an unusual position because the chart below from @Techs_Global shows that when the service providing jobs subtracted by the goods producing jobs falls, it usually means there is a recession; however, this time has been different. The reason for the difference is services job growth has decelerated while goods producing job growth has accelerated. Usually both decelerate into a recession. 2017 and 2018 have been great years for manufacturing and industrial production. 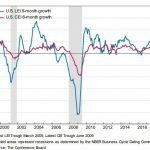 The decline in service providing job growth isn’t enough to catalyze a recession, but it will be worth looking out for once the volatile goods producing sector has another cyclical decline in the next few quarters. We gave an overview of the latest employment data from May. The great part of this article is that you can use some of the points made to build a thesis that the labor market is full or that it isn’t. It’s not a clear cut answer. One thing that is clear is that the job growth in May was impressive, further supporting the narrative that there has been an acceleration in economic growth in Q2. PreviousWhere Is Inflation Headed Next? NextWhat Is Driving The Stock Bull Market Higher?